Again they have invited us to give demonstrations para-agility and also as servicedogs. Joep and my youngest dog Joy have given demonstrations and Joy have showed she can work very enthousiast as servicedog and enjoy to practise the agility-sport! Sometimes distractions by smells ( and sometimes dog- biscuits) of other dogs in the ring, but with the pressure of the public she have not any problems, notwithstanding her young age of just 18 months! They had asked me to show something with my dogs as servicedogs, so I had taken Joep and Joy with me to the Club. Even I took along a televison-screen with a DVD with video-recordings of para-agilty. They like both very much. 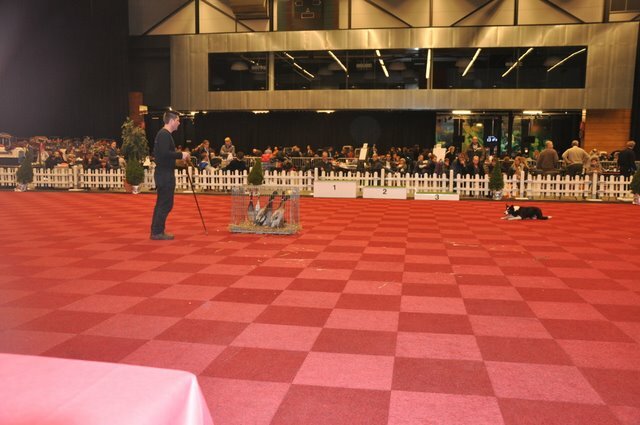 For the third year they have asked us to give demonstraties on the IJsselshow in Zwolle. Always a programme full of very nice demonstrations into the ring of honour. Joy have showed to like giving demonstrations as servicedogs. After Joep had given his demonstrations she had done thinks like: pick up a coin and bank-card, clean-out a shopping bag, give help by put off my coat, cloths out of the washing-machine and also untie the velco of my hand-brache! The Country Golf Club of Ees (Drenthe) had, for the second time, organised a day with all kind of activities and a lot of several stalls. The hole income of this day for the organisation "Servicedogs" training school for servicedogs. Joep is also certifited by this organisation. 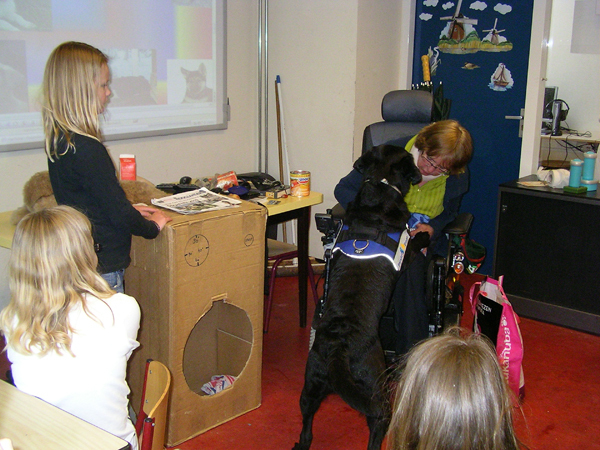 Joep and Joy have demonstrated how a servicedog can give a lot of help to someone with a disability. Special Store for all kinds of animals " Westrienen" in Est, have organised, for the second time, a day with all kind of information and demonstrations about horses and dogs. They have invited us to give demonstratiosn servicedogs and para-agility for the hole day. About 2500 visitors for this event with the name " Peerdefestijn". 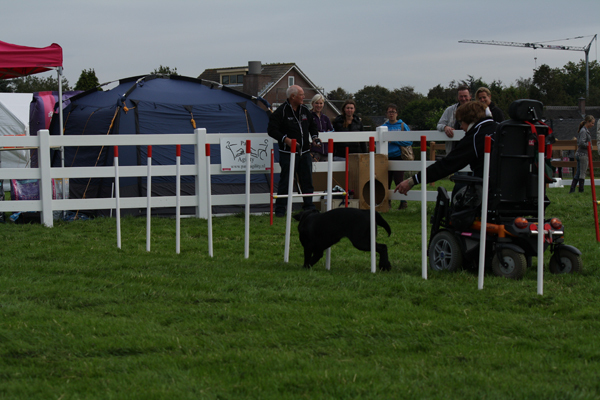 My young dog Joy took part, with a lot of fun, into all demonstrations together Joep. For the third time was organised a special " Dog-day" on the Erkemeder-beach in Nijkerk. This is a camping situated on the Veluwe-lake with besides a recreation-area, hole year accessible for dogs. You can walk on the dike or swim together your dog into the lake! This year more than 100 information-stalls, for visitors entry free. 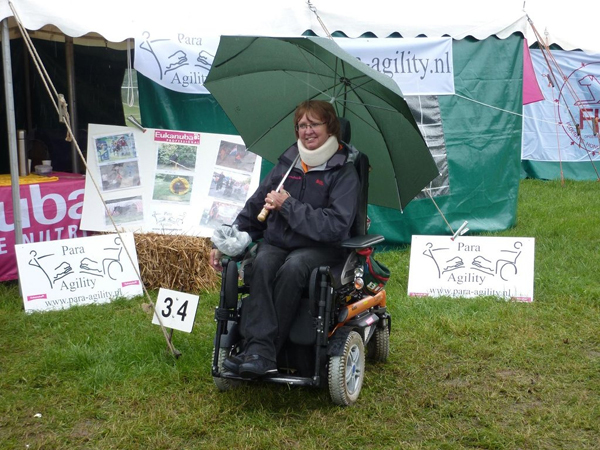 We have given demonstrations service-dogs and para-agility, and also some workshops agility. A very nice 3- days Event with 375 stalls and several rings for every day a lot of demonstrations. We had our own information-booth Para-Agility, beside us the one of S.Servicedogs. 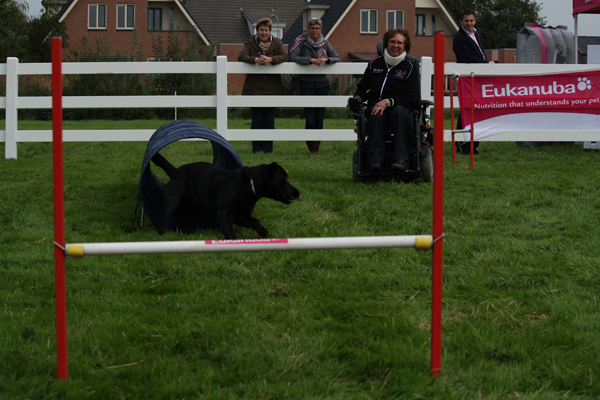 All three days we had given demonstrations para-agility and assistence-dog. Notwithstanding for all days about 50.000 visitors! notwithstanding the bad weather, it was very useful! 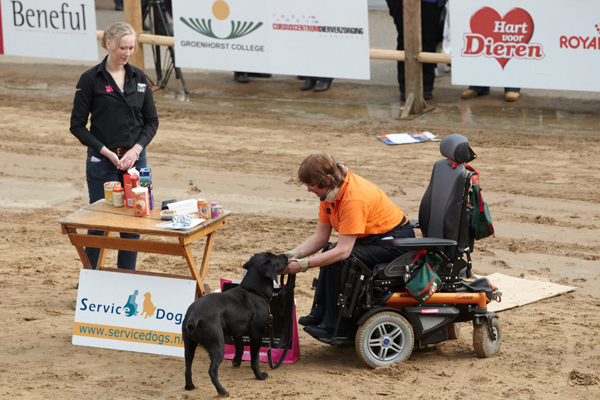 Sofie Bezuijen had asked me to give some help on her speech about Assistence-dogs. During Joep was working the children had listen very enthousiast. Her mother is also practise agility with their dog Tazz, so we had set up some agility-obstacles on the schoolyard and could even show agility! The children enjoyed very much!! Once more the organisation of the 5th Animal Event, a big Horse- and Dog Event, had invited us to give demonstrations as assistence-dog and para-agility, also to give workshops agility. A very nice Event with a lot of visitors! 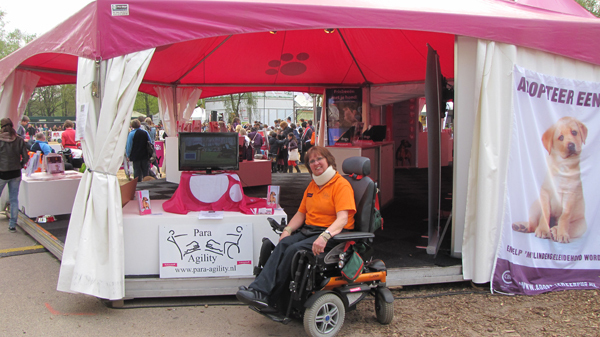 This year we had our own information- booth about Para-Agility in the big stand of EUKANUBA. Also Joy could show in the ring she can work very enthousiast as assistence-dog. Saterday and Sunday we had given demonstrations servicedogs and para-agility on the 17st Dogshow in the Hall Plantarium in Hazerswoude-Dorp. 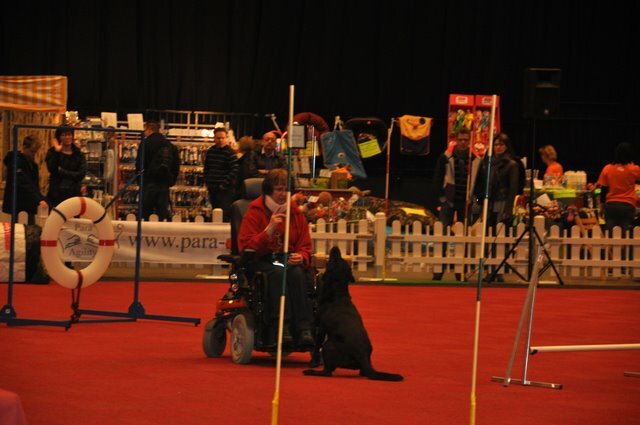 We had make a little information-stand about the organisation Servicedogs and Joep had given every day two demonstrations as servicedog, besides para-agility. The visitors were very enthousiast, because he could show after this demonstration also practise para-agility.............working as servicedogs and sporting-dog! Friday we left to Groningen, the organisation of the Martinidogshow had asked us to give demonstrations para-agility and servicedogs. Also the organisation Servicedogs was present with an information booth and Joep had given several demonstraties as servicedog very enthousiast. Also my youngest dog Joy, 9 months old, could show a little demonstration like pick up a keychain, a couple of towels out of our washing-machine and apport some little things out of a shopping-bag. Even demonstrations of Combi-Sport, an aggregation of compliance and agility by Mario van de Pol (www.combisport.net ). My oldest dog Quita could take part into this demonstration Combi-Sport and have show us she was not fotget how to apport a wooden dumbbell. Mike van der Most in action Ria and Mike van der Most (www.descheperij.nl )attend great demonstrations driving runner- ducks together one of their border collies, very nice to see! A very succesfull weekend where we all have showed how dogs can be deployed.